This morning I was told it was raining. Why told? I had my headphones on, and they're noise canceling. If you don't have a pair, they are highly recommended. I was listening to a classical station on Sirius XM and classical music is one of those things I can turn on and use to completely focus on the task at hand. I've been listening to it all my life and was probably the first sort that I remember along with my father's Swing Music. It was either me with the World Service of the BBC on shortwave, the local classical station, or Dad's swing. Ok, I've always had some "out there" tastes in music. With the combination of some Mendelsson and a quiet house, a mentally engaging task, and noise canceling headphones, I was deeply focused. From behind me in the Poang, over my right shoulder I heard flapping. Usually when I hear flapping I look up to see what my old companion of 25 years is up to. Oscar has been with me since 1986 so I have gotten used to his noises and actions. Just looking up, I realized that the other sound that was buried under the strings and brass was rain. I checked radar and there was a little yellow blob that had blown up over head. Since Oscar was getting excited, I said "Hey Oscar! How about a Shower?!?!" and got his standard "urp!". 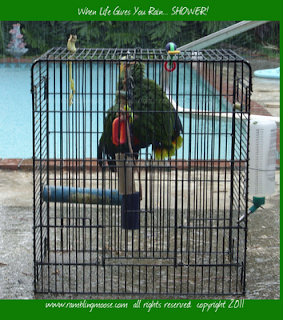 This picture was from an earlier rain storm and an earlier post, but if you want to see someone enjoy the weather, put your parrot safely outside in a cage in a rain shower and watch. This being Florida, we had torrents of rain and sun at the same time so I could watch him from the kitchen window and roast coffee. Better to have a happy parrot than having him inside screaming at the popcorn popper for 6 minutes and 20 seconds! Walking out to the back yard, even before I opened the door, I heard a "HELLO!". Oscar wanted inside. Happy and cleaner, he's back on his perch in the living room chewing on a popsicle stick. Great way to welcome the first day of Autumn.